No conditions proposed on 59 drilling licences near top wildlife sites – DRILL OR DROP? The government proposes to issue 59 oil and gas licences in areas close to the UK’s most important wildlife sites with no conditions on the activities of operators. The licences make up just under half the blocks that will be released following a public consultation currently underway. Most are in Yorkshire, the East Midlands and Lancashire. Many are within a few kilometres of ecologically-sensitive areas, such as the Wash, Humber Estuary, Flamborough Head, North York Moors, Gibraltar Point and the River Derwent. Another 73 licences (55% of the total), which either contain important wildlife sites or are within 1km, will be issued with conditions. This could prohibit exploration, development or production at or the near surface in part of the block. The details are included in consultation documents published earlier this month by the Oil and Gas Authority, an agency of the Department of Energy and Climate Change. The consultation runs until the end of September. Together, the 132 licences make up a second tranche of blocks to be issued under the 14th Oil and Gas Licensing Round. They underwent an assessment because they were within 10km of wildlife sites protected by the Habitat Regulations. The assessment under the Habitat Regulations looked only at the impact on the habitats and species of the sites. The first tranche of licences, comprising 27 blocks, were not included in the consultation because oil and gas developments were not regarded as having any likely significant impact on the wildlife sites. Granting a licence gives an operator exclusive right to search or drill for oil and gas. But it does not give permission to drill. If permission were granted under planning and environmental permit regulations other conditions would be likely. The 59 blocks where no licence conditions are proposed are shown in dark green on the maps. One of the biggest clusters runs north along the Wolds Way, from Market Weighton, past Pickering, and Driffield, to the west of Scarborough. All the blocks are within 10km of River Derwent SAC, the maximum distance at which oil and gas activities could have an impact on the wildlife sites. The cluster includes licence blocks: SE84, SE85, SE86b, SE87b, SE87e, SE88c, SE96a, SE97a, SE97c and SE98c. The second cluster runs from Lincolnshire to the East Riding, inland from the east coast. One of these blocks (TF46), west of Skegness is within 10km of the Wash and North Norfolk Coast SAC, the Wash Ramsar site, Gibraltar Point SAC and Saltfleetby-Theddlethorpe Dunes and Gibraltar Point SAC. (See TA05, TA06b, TA07a, AT08, TA15, TA18, TF38c, TF39b, TF46, TF47, TF57). A third no-condition cluster is in south Yorkshire, running from the edge of Sheffield to Chesterfield and Mansfield. Four blocks are within 10km of the South Pennine Moors SAC and SPA. A group of seven blocks near Worksop, Doncaster, Retford and Newark are within 10km or border the Birklands and Bilhaugh or Hatfield Moor SACs and Thorne & Hatfield Moors SPA. (See SK38, SK39, SK46c, SK47b, SK55, SK56, SK57c SK59, SK66c, SK67a, SK76b). 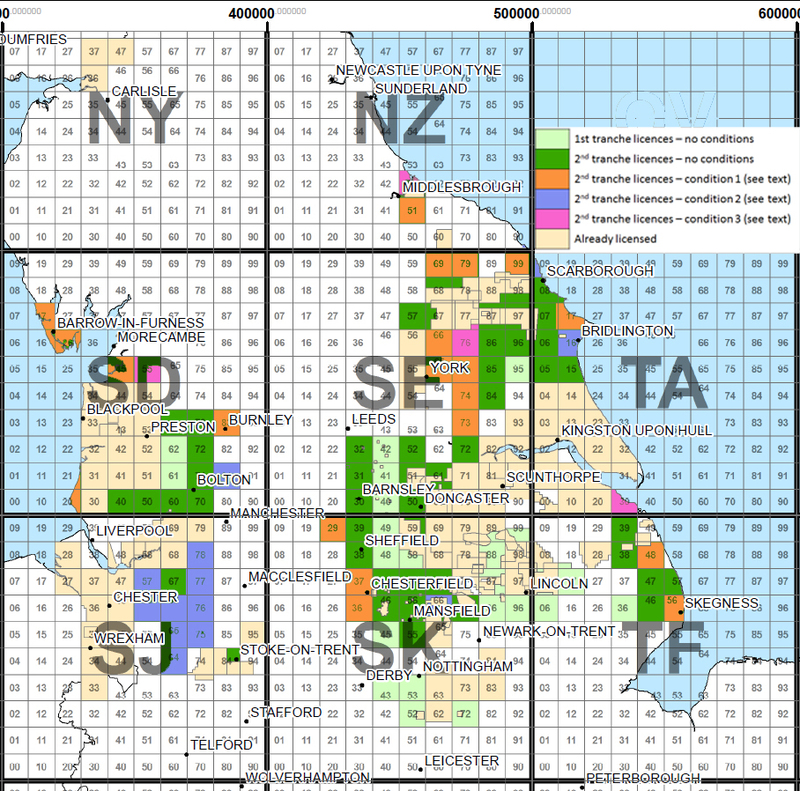 Condition 1 (39 licences – orange areas on the maps): No intrusive exploration, development or production at or near the surface within boundary of all the wildlife sites in the block. Non-intrusive exploration could also be prohibited in places. Condition 2 (16 licences – blue areas on the map): No intrusive exploration, development or production at or near the surface within boundary of all wildlife sites in the block. 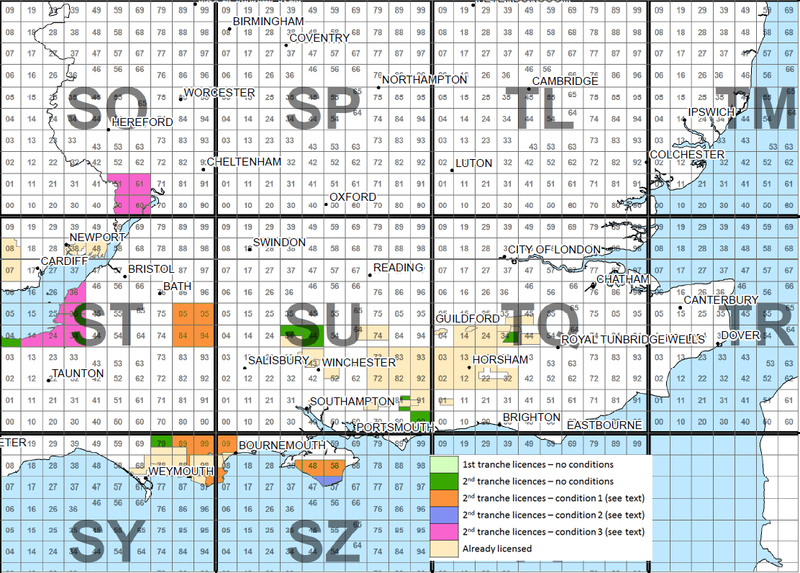 Condition 3 (18 licences – pink areas on the map): No exploration (intrusive or non-intrusive), development or production at or near the surface within the boundary of all wildlife sites in the block. The consultation does not propose to ban oil and gas activity from the entire area of any licence block. The most stringent conditions, Condition 3, are proposed in two key areas: the Somerset/North Devon coast and the Severn Estuary/Forest of Dean. Condition 1 is proposed for licences in Dorset and the Isle of Wight, the Lincolnshire coast, Wiltshire, and south Yorkshire. Condition 2 is proposed for a block of nine licences in Cheshire, which include or border sites such as the West Midlands Mosses SAC, the River Dee and Bala Lake SAC, Mersey Estuary Ramsar/SPA and the Midlands Meres and Mosses Ramsar. We’re currently entering the details of all the licence blocks into a database and will add them to DrillOrDrop.com over the next few weeks. I have to say this the most undemocratic and disgraceful act yet by this government. They have listened to industry and ignored the public completely. I am not an anti fracking activist and came to the fracking debate from a neutral position. However it is clear this government is behaving appallingly and in a completely biased manner. Nothing is sacred. Some of the blocks are actually within the North York Moors National Park and could not be fracked from outside the Park. Furthermore it is the setting of these areas which is also important in terms of landscape value. Not to mention many of these areas are crucial wildlife habitats. Let us not forget also that people live within these areas as well and industries such as tourism and agriculture operate. It is time that the country woke up, took notice and opposed these plans. The government has gone back completely on its word about protecting these important areas. The scale of what is being proposed is obscene – and don’t forget there will be the 15th Round. No doubt the Yorkshire Dales and other areas will be earmarked. I am a northerner and I along with many will fight this government tooth and nail to protect our countryside, heritage and quality of life. These licence blocks have been slapped on whole areas without the prior knowledge of those that live there or work to maintain our most valuable natural assets. And please those people who support this industry – don’t even try to imply that fracking will not impact upon these areas because given the sheer scale of the licensing blocks – of course it will – not to mention HGVs, noise, light pollution, vibration and all the rest. Whatever happened to democracy? Every politician that supports fracking should be compelled to live in areas that are going to be devastated by this obscene dash for yet another fossil fuel ! Does nothing count with this government? Are they prepared to risk damaging our health, polluting our water supply, impacting on wildlife and important areas of conservation and the whole Eco system ? I suppose they think “it’s grim up north” it wasn’t ! But it will be when this government have their way ! Have been thinking about fracking in terms of food security (they fill us with crap about energy security, but this is more significant). In March the NFU said that we soon import over half our food. A most appalling figure anyway, but I digress. We know shale beds that the government would love to frack cover 60% of the landscape. Most of this is rural farmland. Thus, following the logic, if they were to frack all of it (and we know it can’t revert to farmland after they have gone), then we could be forcing that importation of food to be as high as 75%. Importing 75% of our food, that’s hardly security! Now then, by the time they had finished fracking in 2050-ish, the world population will be 9 billion. THose countries we currently buy food off will simply not have the food available to sell to us (ignoring the affects of climate catastrophe on world food production for a moment). In other words, all-out fracking could be condemning 75% of the population of the UK to death by starvation. That to me is how stark this imposition of fracking is.